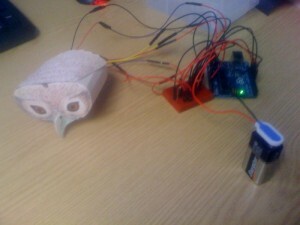 My first arduino project: A light-sensitive model owl. I was inspired by a ‘Birdmobile’ model of a ‘Little owl’ which I had constructed over the New Year period. Such a beautiful thing and very life-like given it’s made only from cut-and-glued printed card. 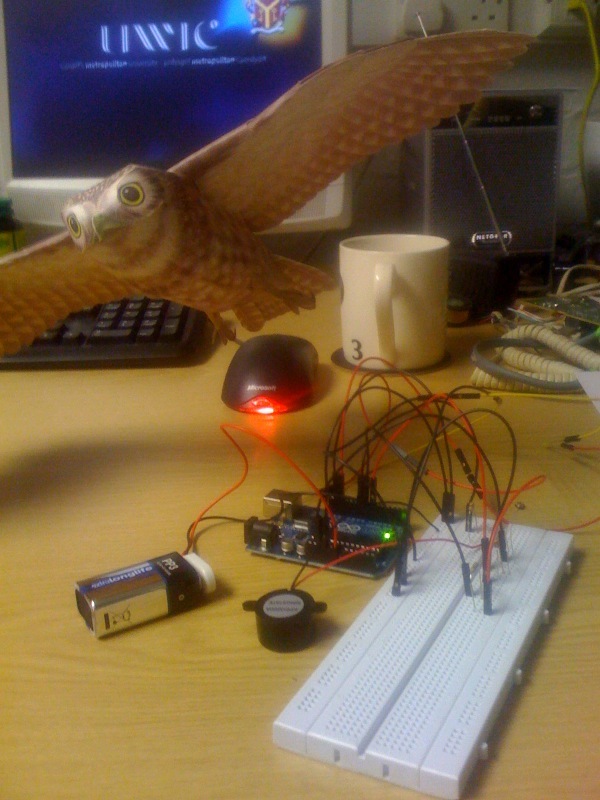 I wanted to use simple arduino functions and basic electronic components to add some further unexpected characteristics to the Little Owl such as an authentic hooting call, light-sensitivity and flashing eyes. OK, so the eyes of a real-life owl don’t “flash”, but are the eyes not the owls most appealing feature? It was frustrating and I tried and tried to make the most simple things happen. 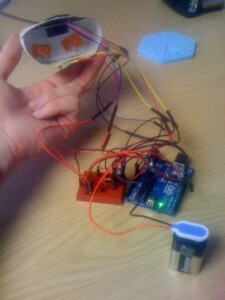 At a point of apparent impasse, I consulted a clever friend of mine who had been using arduino fairly extensively for his PhD thesis and he pointed out where I was going wrong. 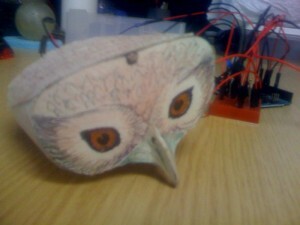 Now the Owl-duino lives! …sort of. 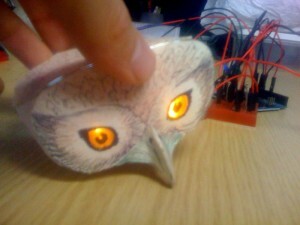 – A light dependant resistor embedded in the owl’s forehead senses when the light levels drop and activates the functions. – Bright White LEDs flash behind the translucent eyes made of yellow cellophane ‘Quality Street’ wrappers. – The eyes flash again, triumphantly and this loop continues until the light returns. I will expand on this by adding electro-mechanical components to add movement such as flapping wings and head movements. 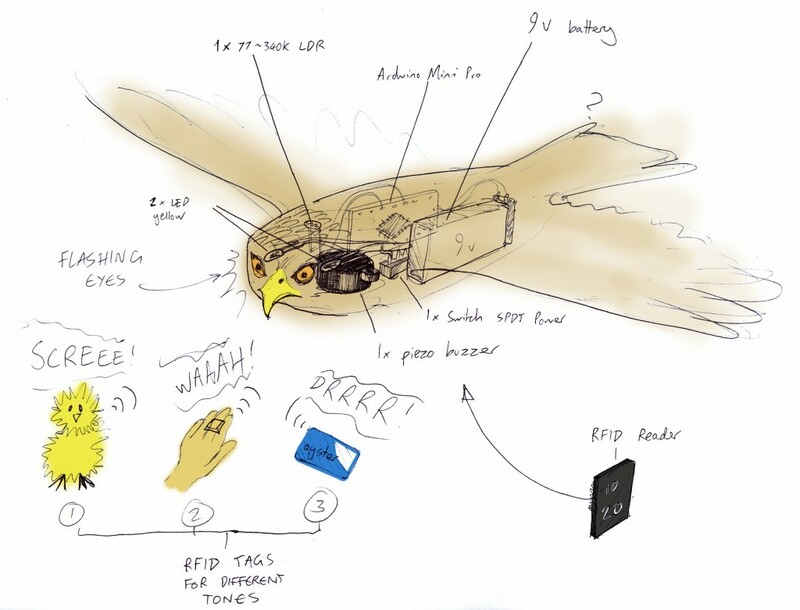 I also like the idea (suggested by my arduino-fixing friend) of adding an RFID tag reader so that the owl can recognise and respond to objects within range e.g. a small yellow chicken toy (containing a tag) could prompt the excited hunter instinct in the owl whereas the presence of a human (perhaps with a tag concealed in a ring) could cause the owl to retreat in caution.